Adaptive Cruise Control. Sat Nav, Bluetooth, Front and rear Parking Sensors, DAB Radio, USB Connection, Smartlink with Wireless Phone Charging, Dual Zone Air Conditioning, 17” Alloy wheels and an Umbrella under the passenger seat. 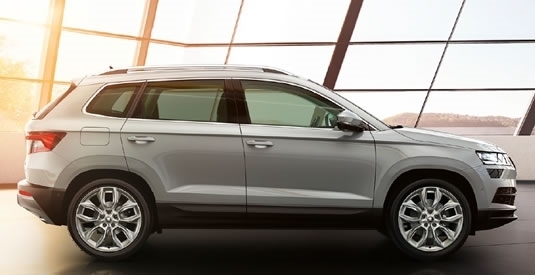 The Karoq is already selling in great numbers and is likely to be highly visible by March when the new ’18 registration plate starts and the launch stock starts to hit the UK roads. Cruise Control, Rear Parking Sensor, Bluetooth, DAB Radio, Steering Wheel Mounted controls. Air Conditioning, 17” Alloy Wheels. The car also benefits from free Metallic Paint and either Black or Grey Roof as standard. 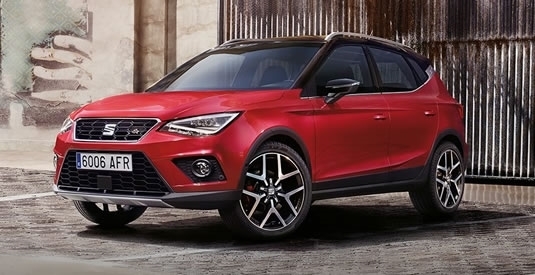 The Arona launch price is competitive and will give the Juke a run for its money with its exciting new looks, great trim levels and superb drive. The cars name is very catchy as well and we cant help singing My Sharona by ‘The Knack’ every time we see the car come up for a quotation. Bluetooth, Cruise Control, Lane Keep Assist, DAB Radio, Steering Wheel Mounted Controls, USB Port, Air Conditiiong, Auto Lights and 16” Alloy Wheels. Bluetooth, Apple Car Play and Android Auto, Cruise Control, Rear Parking Sensor, DAB Radio, Steering Wheel Mounted Controls, USB Port, Air Conditioning, Auto Lights, Roof Rails and 17” Alloy Wheels. 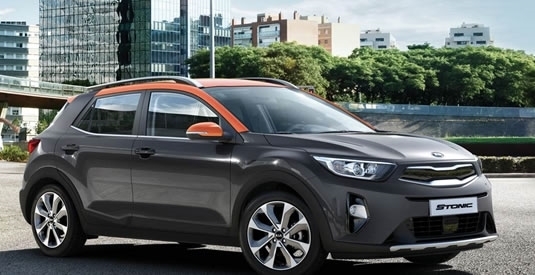 The Kia Stonic is a tremendously good looking car and as with all our featured cars will be visible on our roads very soon (If you have not seen one already). The one marked increase in the offers we are seeing in 2018 is the rise of the Petrol engine. The manufacturers are all offering smaller engine sizes with larger power outputs and increased fuel economy. When we consider in 2007 Ford introduced the Ford Fiesta ST 2.0 Performance version with a 150 bhp engine, and in todays market you can get a Skoda Karoq with a 1.0 125 bhp or a 1.5 150 bhp version it just shows how much more value for money you are getting by opting for one of these smaller engine sizes. 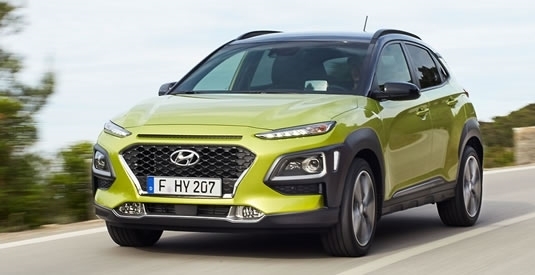 We highly recommend test driving the 1.0 engine as it is the complete opposite of what your brain would expect, it is fast, it is quiet and it is economical and more than powerful enough for any of the vehicles in the market today offering this drivetrain as standard. We have car leasing offers on all of the featured offers as well as many more. We will keep you appraised of further developments in the market as the year goes by. Why not get in touch with us @car4leasing and let us know your thoughts?